Looking for solutions to the problem of small production slurry seal pavement maintenance? 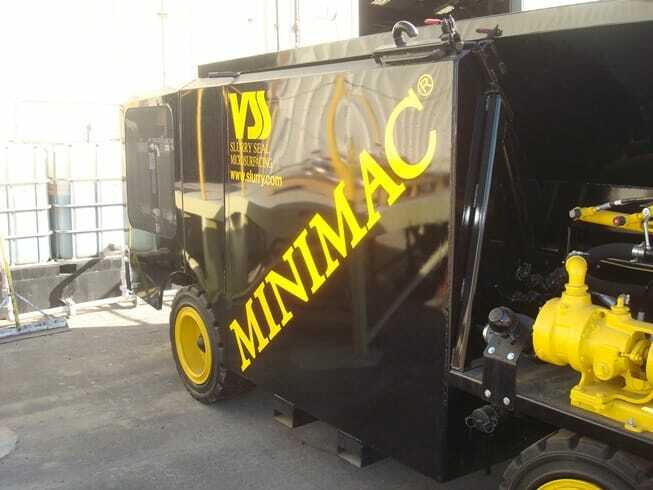 The answer is here: The VSS Minimac – the world’s first successful one-man, self propelled slurry seal/micro surfacing machine. 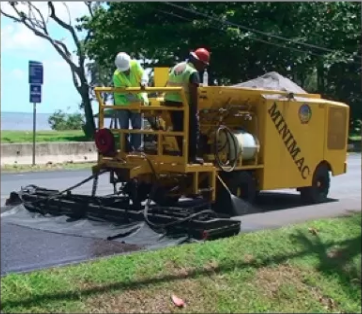 The VSS Minimac is the go-anywhere tool that has increased the scope of slurry pavement maintenance today. Its size and weight make it a natural for jobs that can’t be done by larger machines. Now, maintenance can be accomplished in areas that aren’t feasible for bigger crews. This machine is feature-packed, beginning with its strongest attribute: simple one-man operation. Critical operations are controlled from a single joystick. 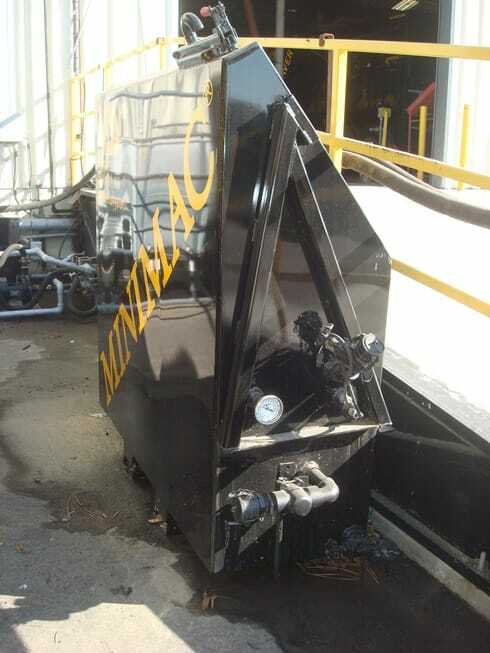 The Minimac is designed for low maintenance and high reliability, and it features top-quality hydraulic components. Auto sequencing assures the consistent application of all slurry seals and other polymer micro surfacings. Material is mixed automatically by a double-shafted pugmill, with production rates up to one ton per minute. The VSS Minimac can deliver material on grades up to 30%, and, with proper materials staging, loading takes as little as five minutes. Cost-efficient completion of small-to-medium production is easy, and doesn’t require a large crew. One operator steers a Minimac, and controls and monitors every procedure. For applications requiring colored emulsions, or different types of emulsions, on a regular basis, this option allows for changing out emulsion tanks rather than having to completely drain and flush the tank when changing emulsions. Option includes two tanks, each 280 gal (1,060 liters). 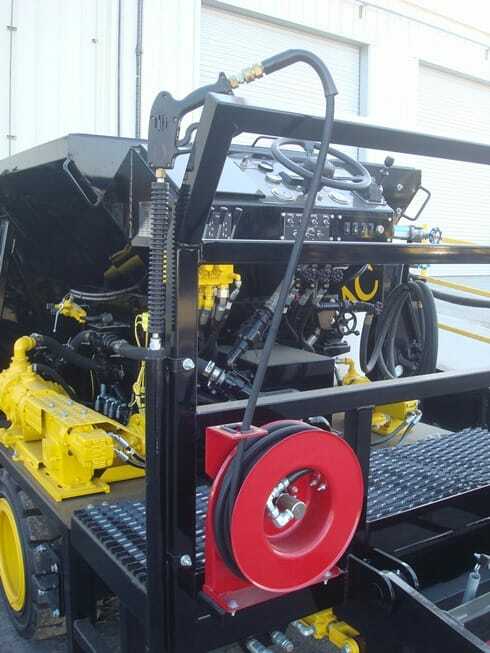 This option consists of a high-pressure water pump developing 1500 PSI. It is powered by the Minimac’s main hydraulic system and comes with 25' (7.6m) of high-pressure hose, recoil reel and hand spray wand. With a flip of a lever, the high-pressure washer is ready to use. The washer will start and stop when the trigger is pulled or released.